League of Legends is a PC/Mac OSX multiplayer online battle arena video game which has become one of the biggest esports in the world since its original release in 2009. With dozens of tournaments held around the world celebrating pro LoL players, throwing around million dollar prize pools and selling out tickets like hot cakes, it’s only natural gamers would want to pay attention to the game responsible for bringing their beloved hobby to the world stage in recent years. If you are a fan of LoL and want to learn more about the game, its format and rules, jargon and terminology and top players and teams, this up-to-date esports guide has you covered. 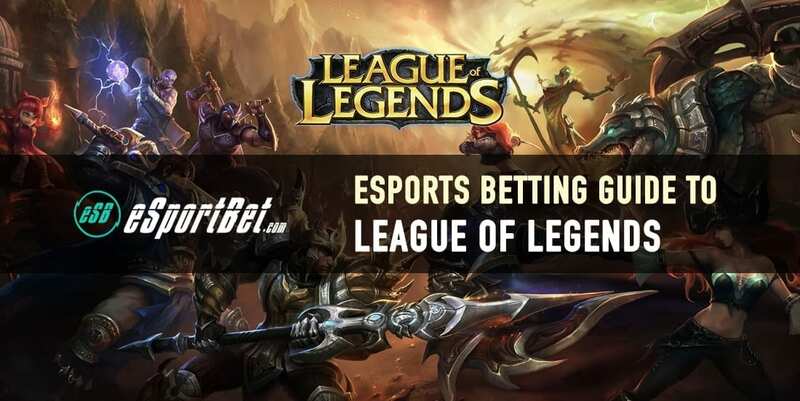 We also detail how to place a bet on League of Legends, the types of betting markets available on each match, and the world’s highest-rated LoL esports betting sites. League of Legends is a fast and frantic multiplayer online battle arena (MOBA) perfect for competitive play, both between buddies and at a professional level. It blends the gameplay of several genres together, including real time strategy (RTS) and role-playing games (RPG) to create something very unique. As an unseen commander with a third-person isometric perspective over the battlefield, players control one of 135 + champions, each with their own unique abilities, skills and playstyles to accomodate a large variety of different strategies and tactics, and pits them against enemy opponents. A typical League of Legends match starts with two teams of five players at opposing sides of a map, called the Summoner’s Rift, which is the only map in the game. The starting area is called the Spawning Pool, which also houses a crucial structure at its heart called the Nexus. The main objective of the game is to destroy the other team’s Nexus, which is not only protected by members of the opposing team, but defensive structures and obstacles such as minions, neutral monsters and turrets. The match is definitively won whenever one team successfully destroys the other’s Nexus first. All champions start fairly weak at the beginning of the match, but as they accumulate gold and XP, the competitive edge can change fairly rapidly depending on the team’s individual skill and cohesion as a unit. A massive part of the average LoL match is completing objectives to earn gold and experience points and spending them to purchase items, increase a champion’s stats and further enhance abilities for additional advantages. It’s already fairly intense in the average, non-professional match-up, so imagine what high-level play is like! Intense doesn’t do it justice – enthralling is a better fit. League of Legends’ 138 character roster can be incredibly overwhelming to digest for newcomers, as it is unlike many other video games, competitive or non-competitive, in its diversity. Every playable champion has unique abilities and fosters particular playstyles and not all of them can be neatly classified under a particular type. However, the developer of LoL, Riot Games, has provided six basic types to help beginners: Assassin, Mage, Fighter, Marksmen, Tank, and Support. Assassin: An agile champion specialising in fast damage meant to take down enemy opponents as quickly as possible, usually with melee-centric weapons and abilities. Excellent at taking down champions with low health pools or slow attack rates due to their mobility, but are also weak in defense to offset their high speed. Some examples of heroes in this class include Ahri, Shen, Twitch and Zed. Mage: A magic-wielding champion specialising in powerful spells and support skills that annihilate opponents quickly and buff allies with a diverse range of benefits dependent on the champion. Many have AoE (Area of Effect) spells which hurt multiple enemies at a time, while others have DPS spells (Damage Per Second) which focus on killing single enemy champions quickly. Their powers are offset by long casting times to execute their spells, low mobility and their low health pools. Some examples of heroes in this class include Anivia, Galio, Karthus, Lulu and Swain. Fighter: A jack-of-all-trades champion usually specialising in being a damage dealer or tank, with a decent health pool and higher-than-average damage output. Usually use melee weapons, but some ranged heroes fir this category as well. Some examples of heroes in this class include Irelia, Lee Sin, Jax and Wukong. Marksmen: A ranged champion specialising in dealing physical damage safely from a distance, usually sustained to wear down opponents as the match goes on. Many champions which fit this classification are high DPS (Damage Per Second) characters, but their offensive lethality is offset by their low defense. Best used for taking out neutral monsters or destroying crucial objectives, such as barons, dragons, and enemy turrets. Some examples of heroes in this class include Draven, Caitlyn, Kindred, Tristana and Varus. Tank: A tough champion specialising in crowd control and keeping opponents at bay because of their high health pool. Their endurance and ability to soak up damage is offset by the low base damage of their attacks. Some examples of heroes in this class include Amumu, Dr. Mundo, Garen, Malphite, and Leona. Support: A support champion specialising in backing up team-members with helpful buffing and healing abilities, or incapacitating enemy opponents with debilitating effects. They are best paired up with other team members, and are useful for scouting out unseen parts of the map with their ability to place wards. Some examples of heroes in this class include Leona, Janna, Maoki, Morgana and Taric. How popular is League of Legends as an esport? League of Legends is arguably tied with Dota 2 for the biggest esport in the world, attracting the largest amount of players worldwide compared to any other competitive video game scene. Last year’s esport industry report from SuperData revealed League of Legend attracted a whopping 101 million monthly active users (MAUs), recorded 1,665 million hours watched on Twitch (April – October), and US $11.4 million in total prize money. Against its closest competitor Dota 2, League of Legends’s impressive stats only fall short to the recorded US $37.1 million Dota 2 made last year. However, in terms of popularity and playerbase, LoL healthily beats out the Dota 2 esports scene – the latter only pulled in 12.6 million MAUs and 465 million hours watched (April – October) in comparison, which is still very impressive. League of Legends also relies on crowdfunding for many of its major tournaments, which it utilises to great effect. The League World Championship 2018=7 prize pool alone raised US $5 million, which is indicative of the massive worldwide appeal and demand the game has as a heavily supported esport. Can I bet on League of Legends esports? Due to the fast-paced nature of LoL’s gameplay combined with the complexity of its RPG upgrade systems and the need to know the in’s and out’s of every part of Summoner’s Rift and the 135 + champions available for professional players to pick and play, we generally recommend anyone looking to place a wager on a high-level esport tournament have decent knowledge of the game first. Otherwise, do some reading and get to know the basics at the very least – luckily for you, we have beginner’s guides to LoL esports betting right here for your benefit. Before you decide to bet on League of Legends anywhere, though, we highly advise reading our beginner’s guide to betting on esports to understand the odds and markets open to you, so you can learn how to actually place a bet on your favourite League of Legends team properly. Esports fans from North America will be happy to know there are several international licensed and regulated online sportsbooks offering betting markets on major League of Legends tournaments, which you can wager in with US dollars. All of the following esports betting sites take match winner, handicap, first baron, first tower, first inhibitor and many other LoL prop bets on the latest League of Legend match-ups, with safe deposit and withdrawal methods such as Bitcoin, Visa credit card and virtual wallets like Neteller and Skrill. BetOnline: The #1 online sportsbook for North American esports fans due to their long-standing reputation with racing and sports betting customers. The site has a small but growing esports betting section, and they take wagers in Bitcoin and fiat currency on a range of the latest LoL, CS:GO, Dota 2, Overwatch and World of Tanks esports events. Read our BetOnline esports review for our verdict. Bovada: Our second pick for USA customers to bet on the latest League of Legends international and North American tournaments. Known for its massive welcome bonuses for both fiat currency deposits and Bitcoin deposits, and even better when you like betting with both types. Bovada also offer betting markets on the world’s most popular esports, including CS:GO, Dota 2, Overwatch and StarCraft II. Read our Bovada esports review for our verdict. Nitrogen Sports: Recommended for esports fans who like to bet in Bitcoin only, because Nitrogen only takes bets with the popular cryptocurrency. The site offers betting markets on all major esports tournaments and games, including League of Legends. Read our Nitrogen esports review for our verdict. Every single online esports betting site offers markets on major League of Legends tournaments, many of them straightforward and easy to understand for the average bettor and some more specific to the game’s unique format. Match Winner: You are betting on the result of the match – which team successfully destroys the other team’s Nexus and wins. The betting terminology varies between sportsbooks, but generally it is known as a ‘Match Winner’, ‘Money Line’ or ‘Head to Head’ bet. The odds are reflective of the perceived skill level of each team, and are usually based on their most recent win/loss records, roster changes and other potential player mishaps. First Inhibitor/Tower: You are placing a bet on the team who kills the first inhibitor or tower. Each lane on the map have towers and inhibitors which can be destroyed by both teams for gold and experience, and other benefits such as spawning friendly super minions to distract the enemy team – at the cost of being distracted with these side objectives. Handicap: You are placing a bet on whether the team with the handicap advantage or disadvantage win one map in a series or to win without dropping a map. Outright Winner: A common type of bet you can place on esports is betting on the overall winner of specific tournaments – not individual matches, but the entire tournament in question.